For the last 20 years the people of the catholic community of Bucaral, have been trying to build something worthy for worship. 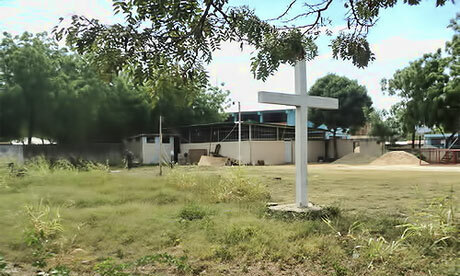 Jean-Claude Colin College, Venezuela, neighbours the parish. It is known only too well, that within school realities at Jean-Claude College, it’s the Chapel that’s forgotten or left until last; the place and building that speaks loudest and clearly of the identity and mission of Catholic education. The current chapel is a shed-like construction that is not structurally safe. Plans for the new chapel have it as a 6 metre high construction, light-weight, but resistant to sun and rain. Jean-Claude College is very fortunate to have donations for 80% of the Chapel, but what appears “so close” for first world investment strategies is “so far” for the college and they are still discerning whether it’s possible to raise this sort of money. One thing Jean-Claude College knows is the longer it takes the more costly the project becomes.